reading challenges for the year to come. Just click on the buttons above for all the details. My friend Yvonne at Socrates’ Book Reviews… is hosting 3 Challenges too. This is a little different than my cozy challenge. A) Read-only cozy mysteries of your choice. 1. The challenge runs from January 1, 2018, and ends December 31, 2018. NOTE: If you don’t have a blog and want to participate, that’s fine. You don’t have to have a blog, just post in the comments section as you finish books. If you belong to a site like Goodreads and review the books there, that’s fine too. Just leave us the link. She also has a group for this challenge on Goodreads and you can sign up here. 5. If you do have a blog, take the button above, put it on your blog and post about the challenge. Then add your name to Mr. Linky below. Please use the link to your challenge post, not the link to your homepage. Just click here to go to Yvonne’s blog to join. I will be participating at Level four (Sleuth Extraordinaire) – My books will be crossing over to my Craving for Cozies Challenge. The challenge will begin on January 1, 2018, and end on December 31, 2018. 3. Book titles may be swapped out at any time for those who make a list in advance. 7. To sign up, choose one of the levels from the above list and use the Mister Linky below. There will be links to reviews and wrap posts later. This challenge was harder than I thought it would be for this year but I am joining again at Level 2 – Kneading – Read 11-20 cat mysteries. Just click here to go to Yvonne’s blog to join the fun. From Yvonne – Welcome to the 2018 What an Animal Reading Challenge. I began hosting this challenge in 2010, when I took it over from Kristi at Passion for the Page. I love reading books that feature animals and am going to host this one again. I hope you will join me. It also counts if a main character is (or turns into) an animal (define that however, you’d like). In the past, books would qualify if an animal is in the title or on the cover, but that alone no longer qualifies. This challenge is for books related to animals and just because they are in the title or on the cover, doesn’t mean it’s about an animal. Challenge runs from January 1, 2018, to December 31, 2018. Books can be fiction or nonfiction. You may make a list of books at the beginning of the challenge or you can just list them as you find them. Book titles may be swapped out at any time (assuming you made a list, to begin with). Crossovers with other challenges are permitted and encouraged. You don’t have to have a blog or write a review, but you can if you want to. To sign up, use the Mister Linky below. There will be links to reviews and wrap posts later. That’s it! Enjoy and have fun! Because I think most of my books for this challenge would duplicate the Purrfect Reading Challenge, I have decided not to participate in this challenge this year. Just click here to go to Yvonne’s blog to enter. This challenge is hosted by my friend Bev at MY READER’S BLOCK and it is one of my favorite challenges because it allows me to try to get a handle on my To-Be-Read shelves. My #FlashbackFriday feature was born because of this challenge. *Books must be owned by you prior to January 1, 2018. No library books. If you’re looking for a library book challenge or one that counts books on your non-owned TBR list, then there may be challenges out there that do that. This one does not. *Feel free to submit your list in advance (as an incentive to really get those books taken care of) or to tally them as you climb. *A blog and reviews are not necessary to participate. If you have a blog, then please post a challenge sign up and link THAT post (not your home page) into the linky below. Non-bloggers, please leave a comment declaring your challenge level–OR, if you are a member of Goodreads, I will once again put together a group for the challenge there. Feel free to sign up HERE if that’s where you want to participate. 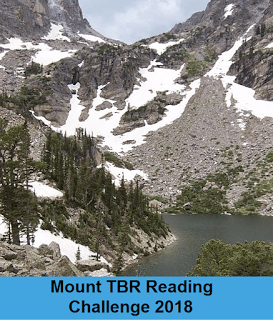 At the beginning of the year, I will update the sidebar link called Mount TBR Review Headquarters for current reviews and progress updates. I am again hoping to complete the Mt. Vancouver: Read 36 books from your TBR pile. Just click here to go to Bev’s blog and sign up. O.K. this is just my first batch of challenges for 2018. New challenges are being announced every day and there are many more listed that I am not participating in. There are 2 places I check in addition to visiting other blogs to stay on top of all the reading challenges. A Novel Challenge and Sleep Less, Read More – Reading Challenges, Events and more!